The Stride Sensor should pair immediately. Once it does, just begin a workout and you are good to go! Tap either the main menu (three bars in the top right) then Sensors, or on the home screen, tap the gear options icon, then Manage Sensors. 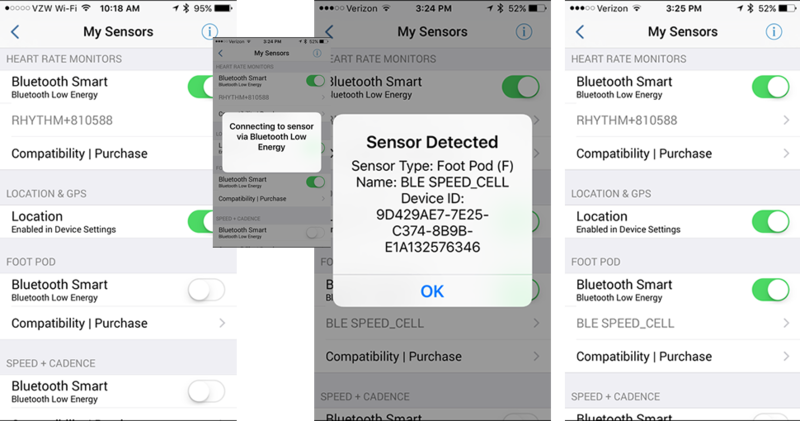 With the foot pod installed (see the manufacturers suggestions and instructions) and tapping your foot (to “wake up” the sensor), turn the Bluetooth Smart switch in the Foot Pod section to ON. You should see a successful pairing notice like shown below, and then see the foot pod information just below the ON button in that section. 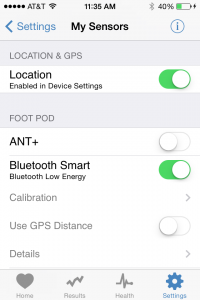 To access more information, delete the pairing, or turn on GPS options with the foot pod, tap the name of the foot pod. See below on Calibration for more. One thing about food pods / stride sensors, however, is that they are not perfect. Just the other day, I caught mine lying about my distance. A foot pod can be calibrated to fit each person’s stride length. 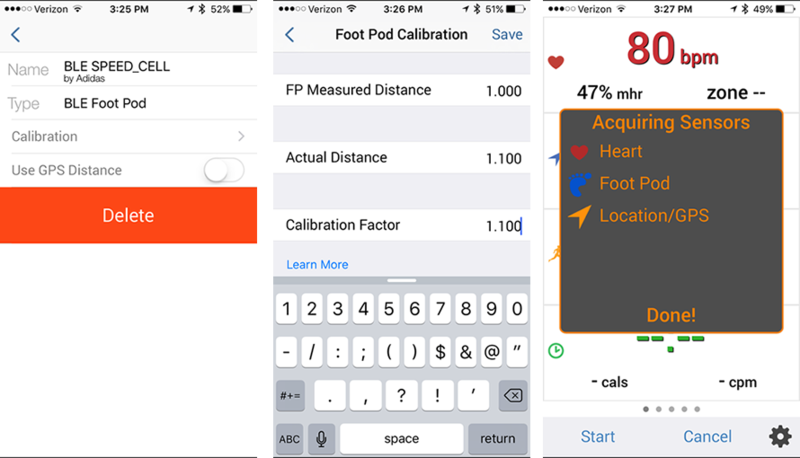 A foot pod is automatically set to estimate distance based on an “average” stride and height, but for everyone else, your foot pod distance can be a little or a lot wrong. For example, if Shaquille O’Neil used the same foot pod, I think The Big Diesel would have strides a bit bigger than Mini-Me’s, leading to drastically inaccurate distance readings. There is also the idea of “average” stride – I’ve found, even after calibration, at times the distance can be a bit off – like in the hills when the stride is shorter. Not much, but a bit. Still, in terms of a smooth pace (especially useful for pace-based routines), faster auto-pause, or times where you don’t have good GPS (treadmills, indoor track, etc) they are very helpful. TO access the calibration screen, from the Sensor screen (shown above) tap on the name of the currently paired foot pod sensor. Note that to true up a foot pod, a calibration factor must be determined. Luckily, You will want to do an initial run with a known distance, ideally a run you do regularly (so it can be using the average stride length on that route as your average), and longer tends to be better than shorter. Tap the name of your Foot Pod from the Sensor screen. Enter that calibration factor in the Actual Distance for 1 mile field. Appreciate the awesomeness that is accuracy! All of your foot pod workouts will use this calibration factor to assure that your Fitdigits results are as accurate as possible. 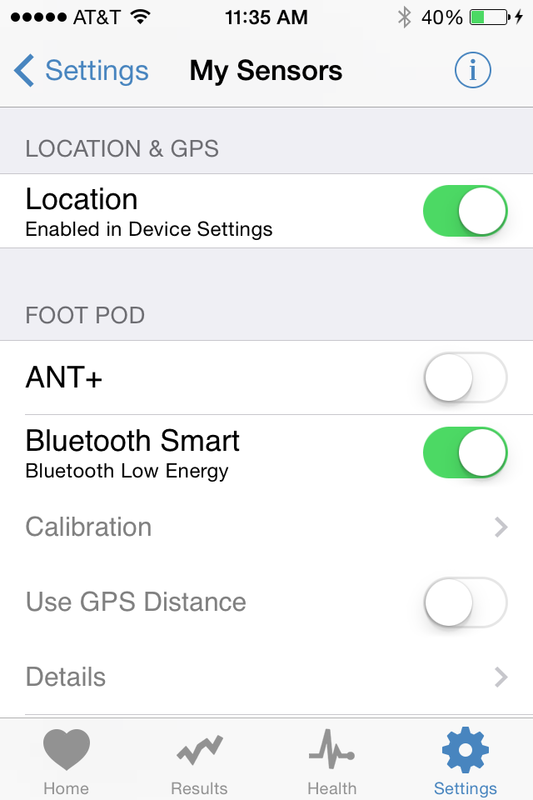 Side note – sometimes the foot pod distance is off due to improper setup. For example, if it is not as secure on the shoe and bounces around a lot, it may be prone to be less accurate. Please consult the manufacturers suggestions. © Fitdigits, Inc. Fitness. All rights reserved worldwide.